What’s the difference between a visa and a permit? Residence-Work Permits > What’s the difference between a visa and a permit? A VISA is an endorsement granted by authorities that denotes an application has been examined and approved for the bearer to enter the country for the purpose of travel, work or study. An immigrant visa (going permanently to another country to live) depends on your citizenship and sometimes the citizenship of a parent if you’re a minor or your spouse if you’re currently married. A PERMIT is an endorsement granted by authorities that denotes an application has been examined and approved for the bearer to reside, work and/or study for a length of time after entry to the country that issued it and before the visa’s validity expires. So one would need a visa to enter/exit the country within a certain time period, then acquire a permit to stay in the country beyond the visa’s expiration date. Not exiting the country before the visa expires and not securing a permit to stay beyond a visa’s expiration date essentially means you are an illegal resident. A penalty will be assessed upon leaving the country for overstaying your visa, employers will not offer you a permit and your passport will be marked until its next renewal, then recorded in a database, causing border authorities to question you upon every entry and exit. A visa or permit granted for a specific purpose cannot be converted if your status changes. For example, a student visa/permit cannot be converted to a work visa/permit upon finishing school and getting a job. Why? Because you met eligibility and requirements, and authorities originally granted permission to the country, on the basis of study, not work. To be granted permission to work, one would need to exit the country then re-enter with the proper visa (after satisfying different rules/laws) and secure a residence/work permit upon arrival. Your website is fabulous — wonderfully useful and straightforward. I’m relocating to Greece this summer to join my boyfriend, who works at the U.S. Embassy in Athens. I’ve been teaching in DC for the past 8 years, and I’m hopeful that a job at one of the international schools will pan out. If not, I’ll be going the student visa route. I have my undergraduate degree in English literature and my masters degree in elementary education. I was hoping you might be able to recommend a graduate program at an English-speaking university in Athens with a low price tag attached (ideally within in the field of education, but I’m flexible). Basically, I just a need a student visa and a legal way to live in the country. Thank you for any insight you can offer! International schools have cut back on staff and recently laid off a number of long-time employees. This information comes from friends who work at the most popular ones in Athens. Should you get hired, good luck. Staff complain of being treated poorly from the first day, i.e., overpriced accommodation is forced on new arrivals in which the school gets kickbacks from landlords, long (unpaid) hours at work, etc. A number of people hired at the start of last year quit and broke their contracts. Ask your boyfriend for recommendations on graduate schools. I have no advice or insights. 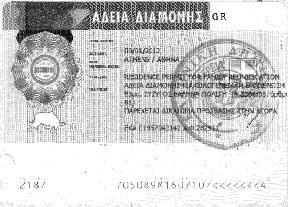 Hi,am a non citizen of the EU country and i got a 1 year national visa to greece,to work as a personal assistance to an old lady,also when i got here was given a 2 year stay permit…does my stay permit qualifies me to travel to other EU countries,cos i know my national visa wont allow that…pls i need to know.